The city of Cuttack is one of the oldest cities in Orissa. Its name has originated from Abhinaba Baranasi Kataka of the medieval times. 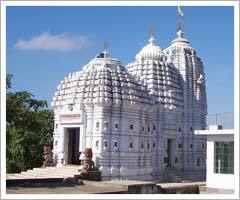 It is located on the delta region shaped by the rivers of Mahanadi and Kathjori. The 11th century AD stone walls on the Kathjori River stand as an exceptional exemplary engineering skills of the early Orissan architects. The Barabati Fort standing amongst its ruins till date, adjacent to the stadium sharing its name, thereby witnesses many major sports and events of the state. The esteemed temple of the Katak Chandi stands very close to the fort. Besides these, another most important attraction of the city of Cuttack is the Qadam-i-Rasool which is regarded and respected by both the Hindus and the Muslims. The shrine with a high complex wall and towers at every corner has three mosques and a Naubat Khana or music gallery constructed in the 18th century. Like Bhubaneshar, Cuttack also excels in shopping arena, especially with special reference to silk and cotton fabrics available in private shops along with the state emporiums. Another field of art for which the city is reckoned nationwide is its silver filigree handiwork formed into various decorative and ornamental items.